The Lord of the Rings has always been a beloved series among lovers of the fantasy genre, but it wasn’t until Peter Jackson’s film trilogy that the whole world became enraptured by Tolkien’s magic. The movies allowed us to see, for the very first time, amazing live-action renditions of Tolkien’s hobbits, ringwraiths, and the One Ring. 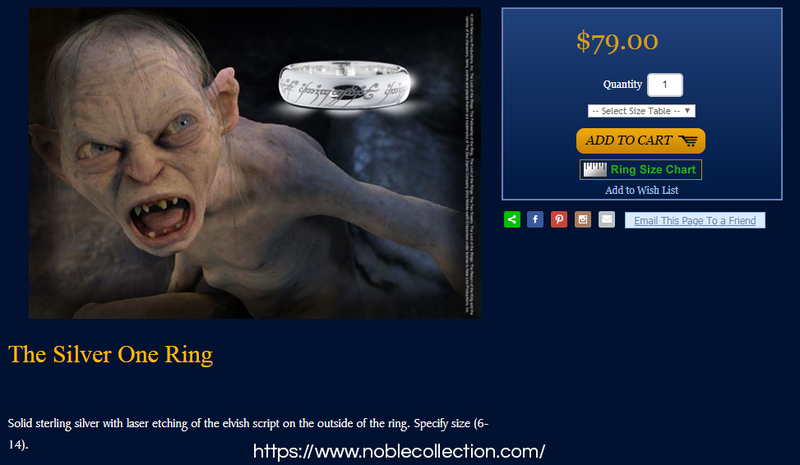 The latter is particularly memorable: a ring as simple as it is beautiful, infused with the power to enslave the world. Fans loved it, as did anyone into anything nice and shiny. 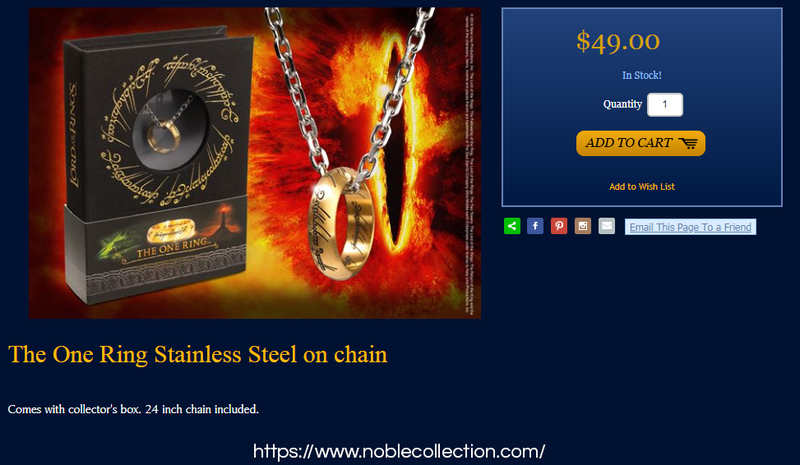 And so, using only premium materials, renowned jewelry manufacturers took it upon themselves to produce gorgeous replicas of the One Ring. 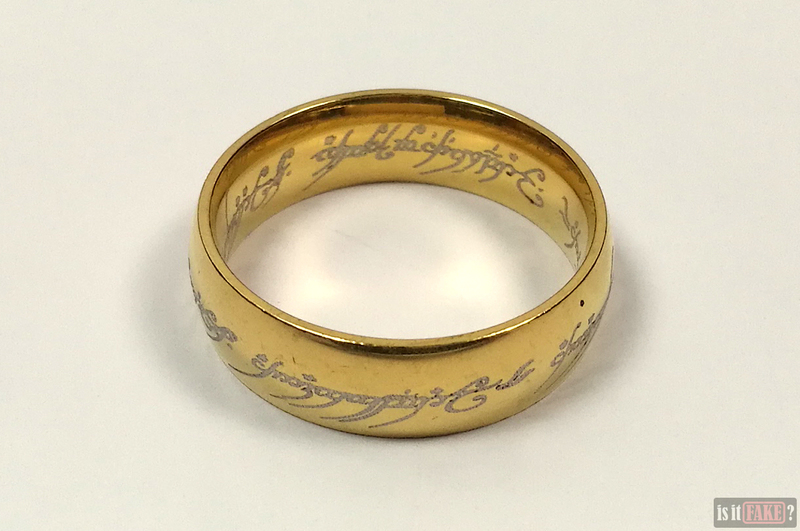 Unfortunately, the same can’t be said for bootleggers, who, upon recognizing the demand for such replicas, also created their own versions of the One Ring. But, while these fakes are far more affordable than legit products, they come with a slew of problems – as we’ll see in today’s review. Like many Chinese online stores, AliExpress is a hot bed of illegal activity. Countless bootleggers and dubious retailers use the platform to sell their counterfeit products by the truckloads, so avoid it if you’re on the lookout for safe, original products. 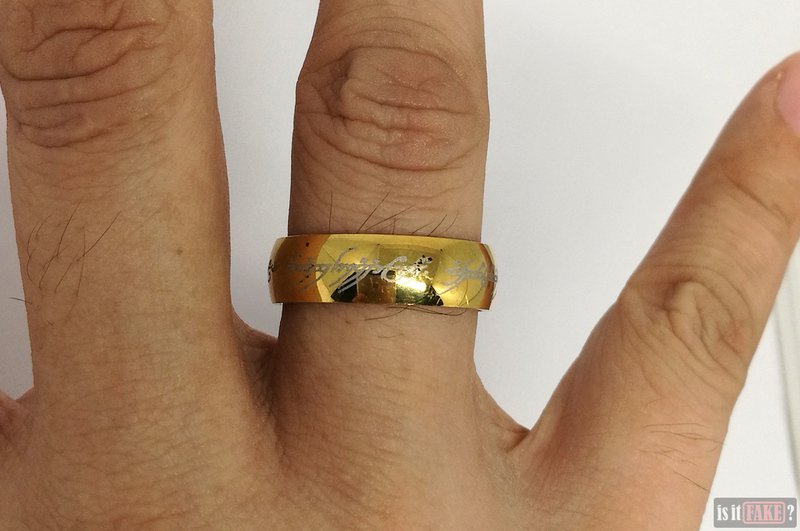 We purchased these fake The Lord of the Rings One Ring replicas from AliExpress. They were manufactured by a “company” named BINQINGZI. 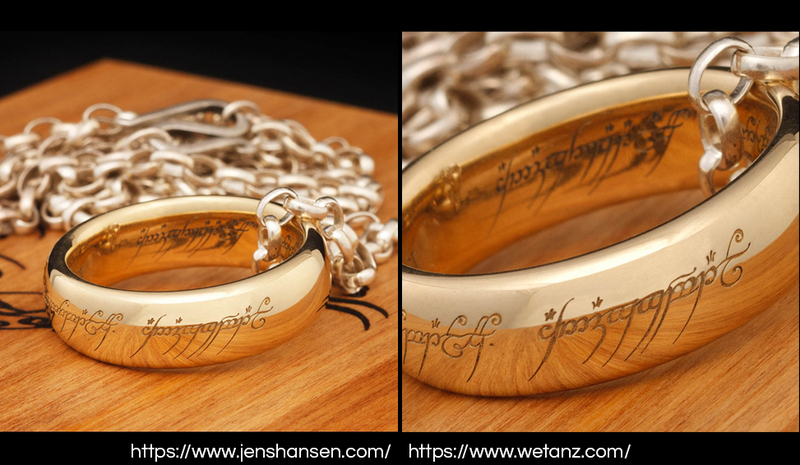 Unlike the legit companies (such as Weta Workshop, Noble Collection, and Jens Hansen) that produce official One Ring replicas, we’ve found no evidence legally linking BINQINGZI with The Lord of the Rings brand. BINQINGZI doesn’t even have their own website. You will, however, find their products on many untrustworthy online stores such as AliExpress and eBay. This is highly unusual. The Lord of the Rings is a giant of a brand – you’d expect its rights to be awarded to only the best jewelry makers in the world. 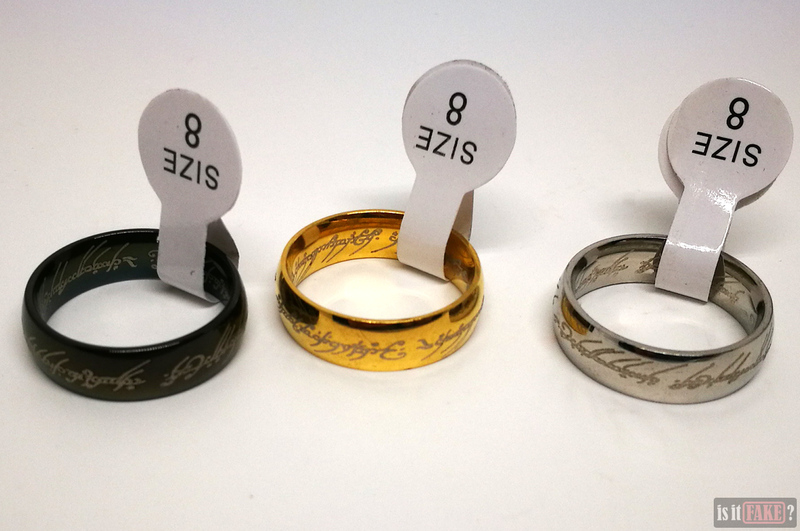 It gets even stranger when you take into consideration the fact that each BINQINGZI ring costs a mere $0.5. There is no way an item made from real gold, silver, or any other rare, precious metal would come so cheap. Let’s discuss what else is wrong with these rings, shall we? 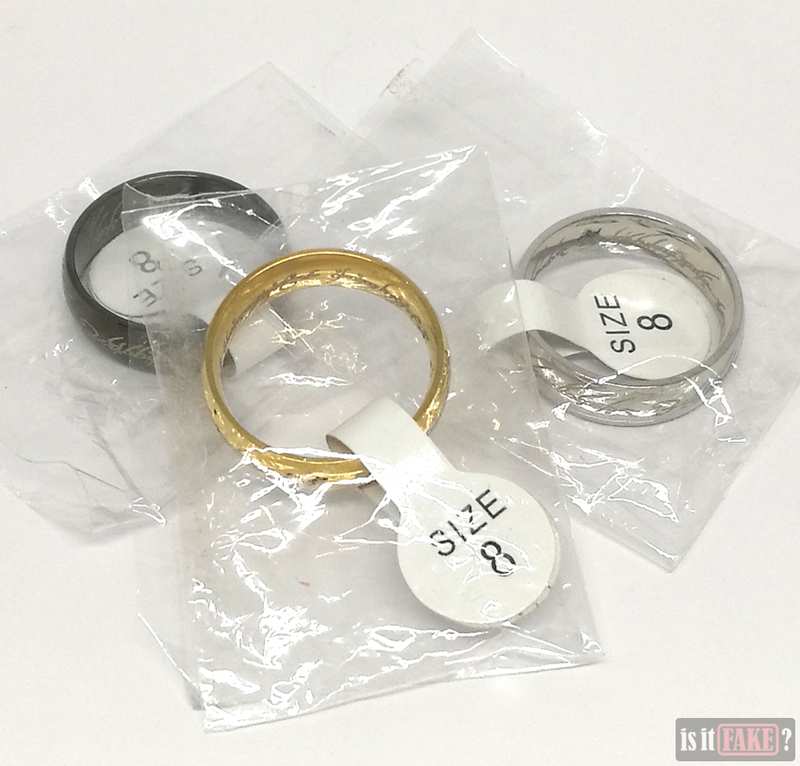 The fake rings also come in three colors: gold, silver, and black. 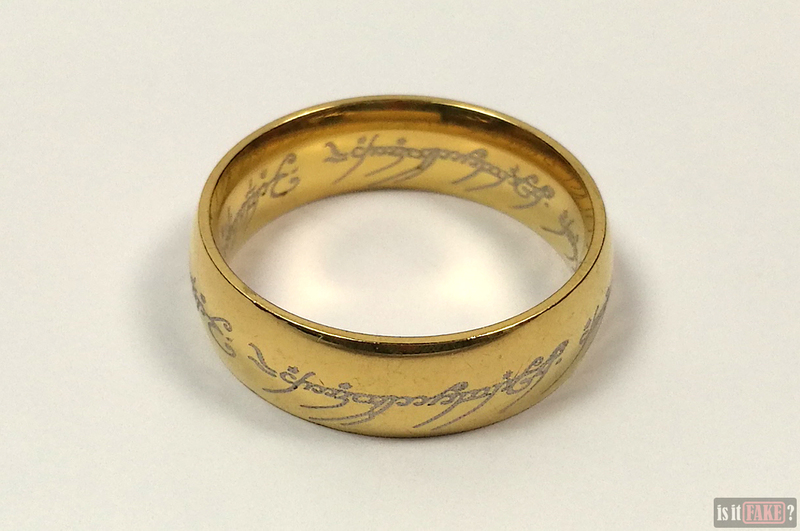 Thanks to the Peter Jackson films, the gold variant is the most recognizable of the three. Give the ring a closer look, however, and the problems start cropping up. As you can see from the images above, the ring looks old and worn, lacking the timelessness of the One Ring. 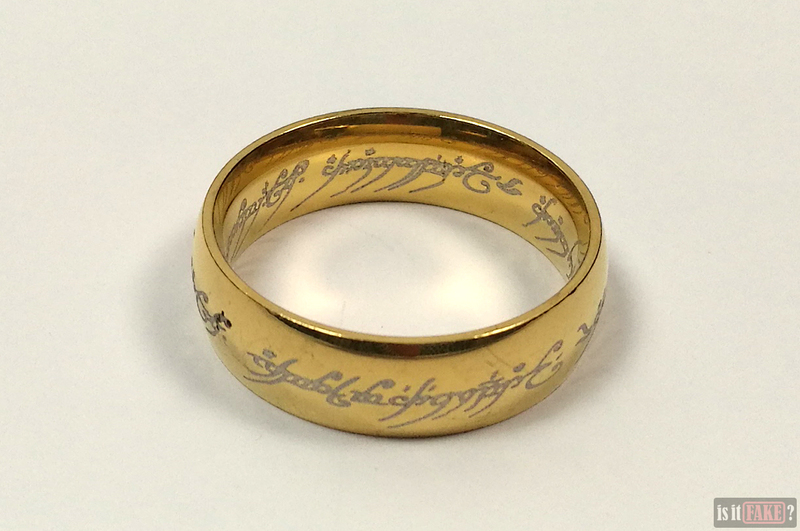 The “gold” plating is already chipped in a number of spots, revealing the dark, ugly, and coarse metal beneath. In some cases the blemishes make the Elvish lettering unreadable. Speaking of Elvish, the lettering on the fake gold ring is chunky, so much so that each character bleeds into its neighbors. This not only diminishes the beauty of the inscription, but also makes it harder to read. Elvish writing is supposed to be graceful and slender, with pointed as opposed to rounded tips. 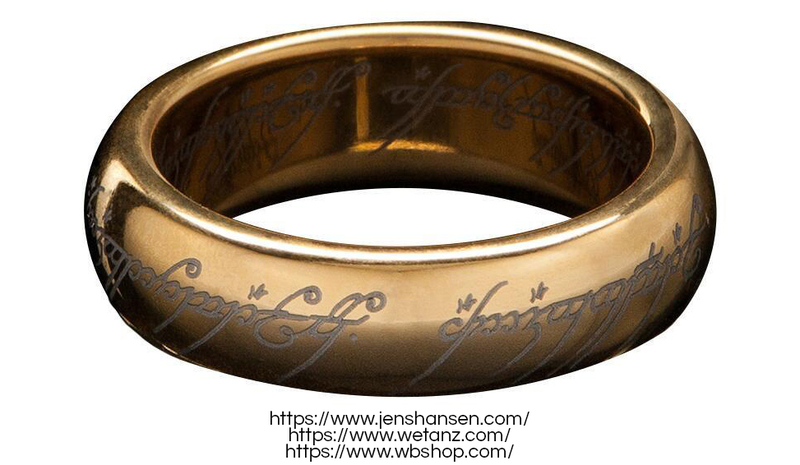 You can see this in the officially produced ring from Jens Hansen and Weta Workshop. The upper and lower rims of the fake ring are angular. 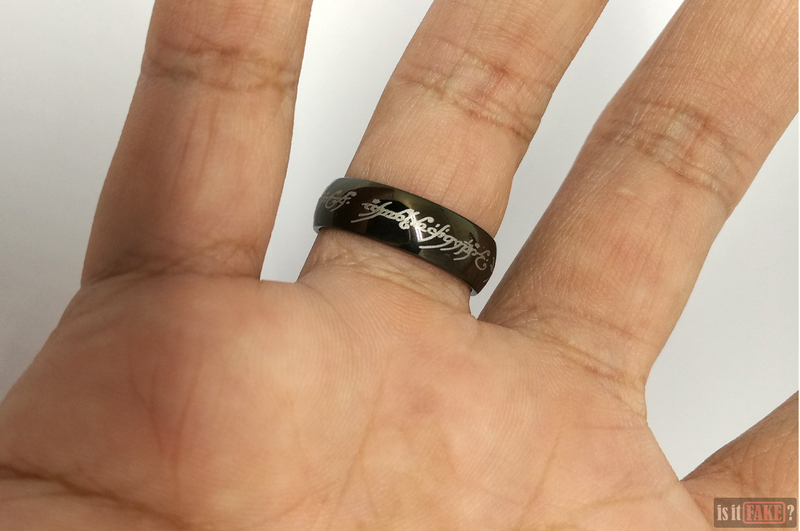 While this won’t cause any discomfort to the wearer, the edges make the ring less smooth to the touch. 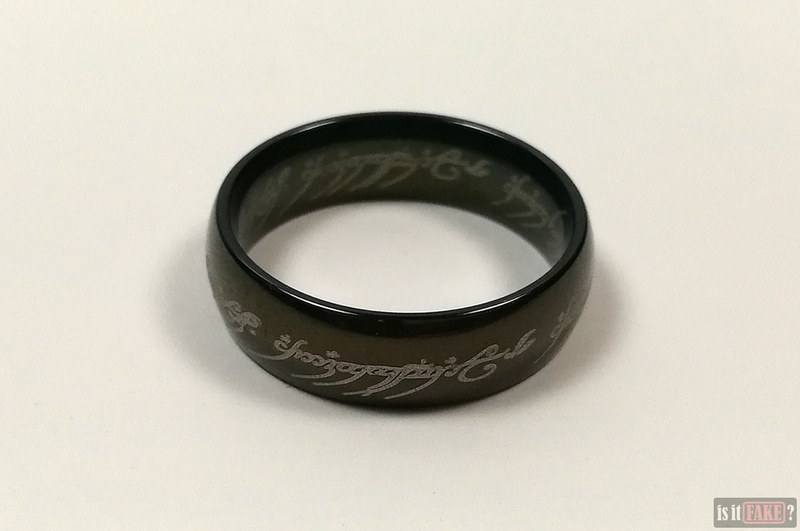 In contrast, the original ring’s rims are gently curved. While the silver ring has the same problems as the gold one, the former has less damage on the outside than the inside. There’s one particularly noticeable blemish on the interior, where a large portion of the plating has flaked off. Remarkably, the black ring appears to be untouched by physical flaws. And even if the plating were chipped, it would be harder to notice thanks to the dark coloration. But the fake black ring does suffer from worse lettering; its characters are stouter and thus far harder to read than the other two’s. 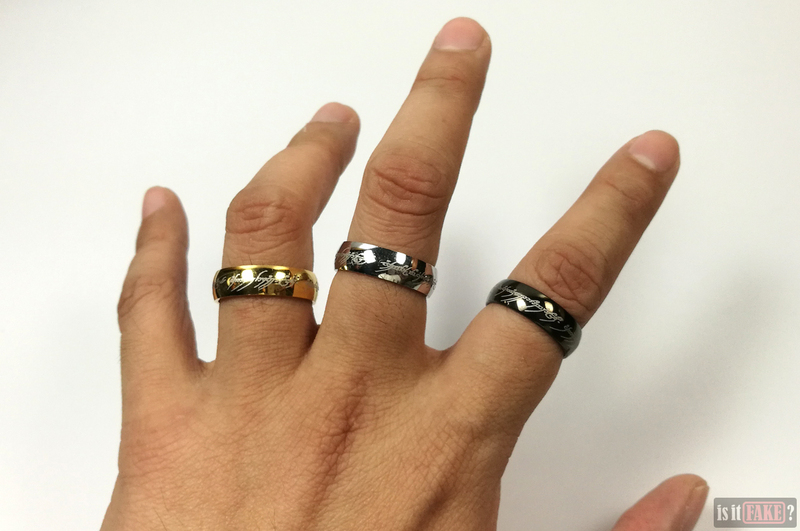 All three rings fit snugly on our model’s fingers. We wouldn’t advise wearing such cheap rings, however. In order to maximize their profit, bootleggers like to cut costs by using low-cost materials when making their jewelry. This is what enables them to sell such jewelry for extremely low prices. However, numerous investigations (such as the ones featured here and here) have discovered that cheap jewelry manufactured in China are more likely to be tainted with dangerous substances, such as the heavy metals lead, arsenic, cadmium or mercury. Prolonged exposure to these toxic materials have been associated with skin irritation, complications in the reproductive system, and even cancer. If a child ever gets hold of tainted jewelry and then swallows them, they could be fatally poisoned, among other potential problems. 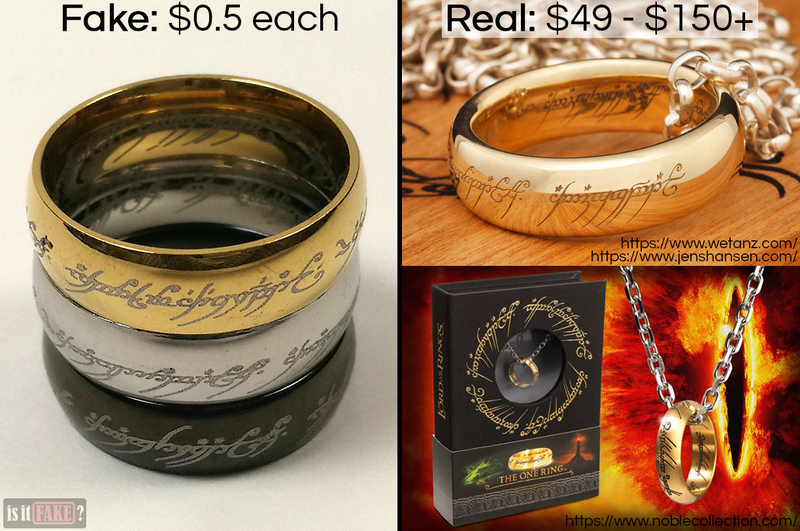 In short, as cheap as they are, these fake The Lord of the Rings rings aren’t worth the risk. Lastly, there’s the issue of the seller playing buyers for fools. 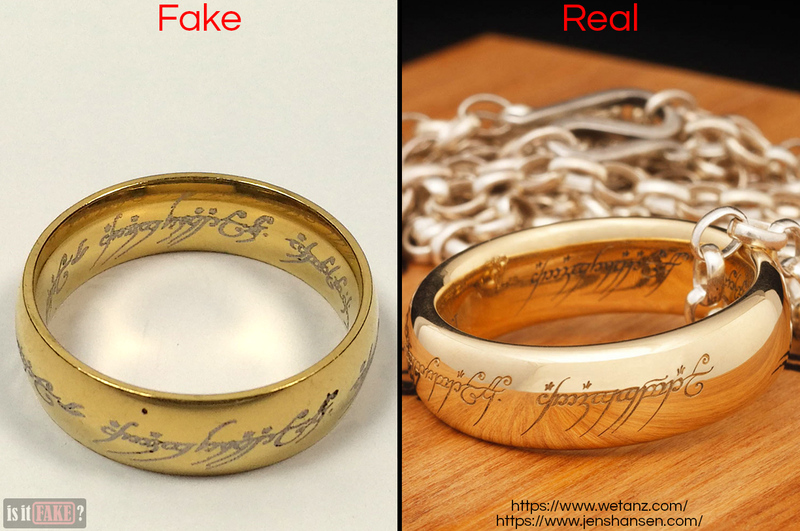 These fake The Lord of the Rings rings were advertised as made from high-quality materials, with the gold one supposedly being composed of 18k gold. These claims are ridiculous to the point of hilarity. From what we discussed above, you’ve already seen the horrible quality of the fake’s gold plating. 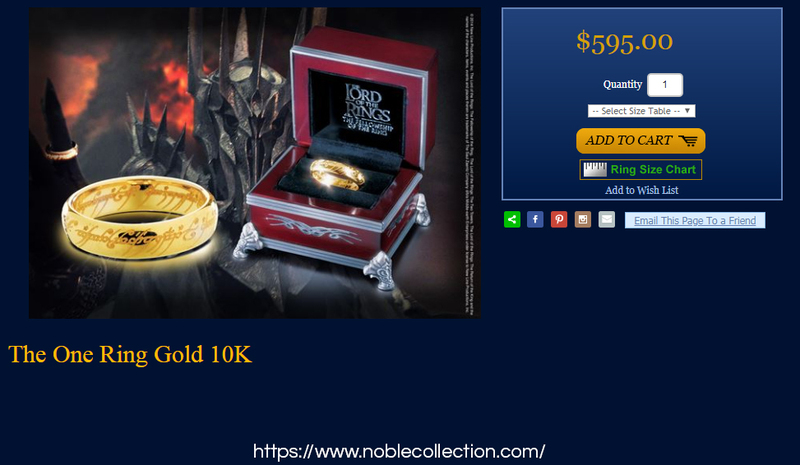 Secondly, there’s no way 18k gold would cost $0.5. 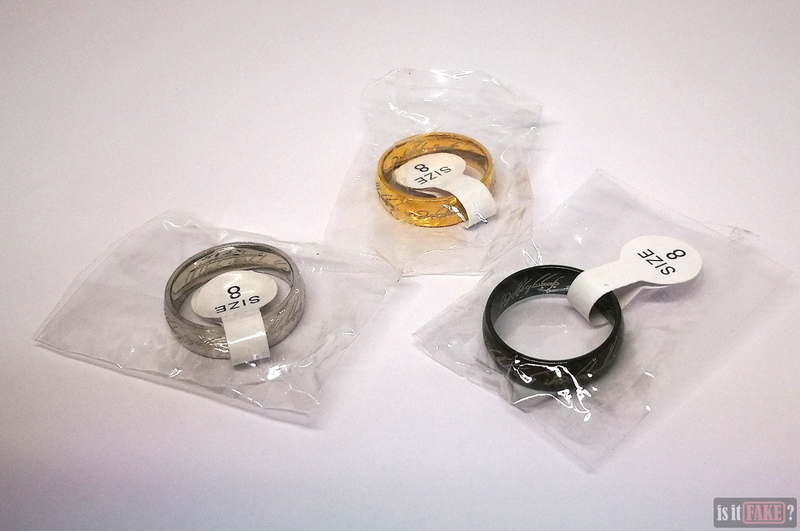 These rings are obviously made from much cheaper and possibly dangerous materials. 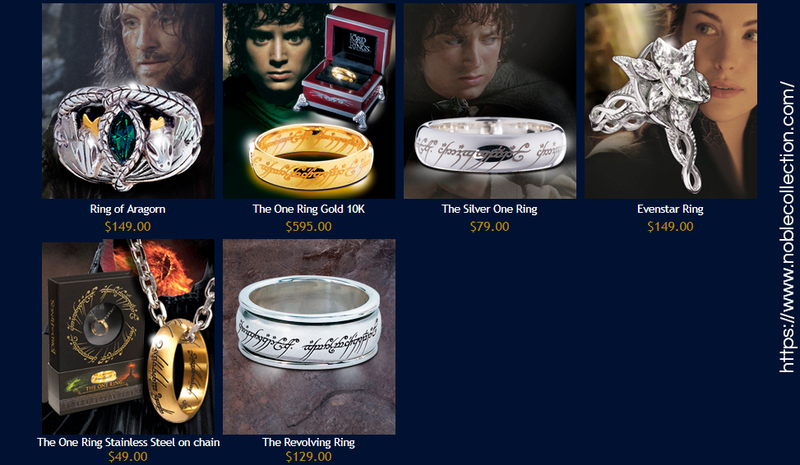 Because official The Lord of the Rings rings are real jewelry, they are, understandably, far more expensive than the fakes. 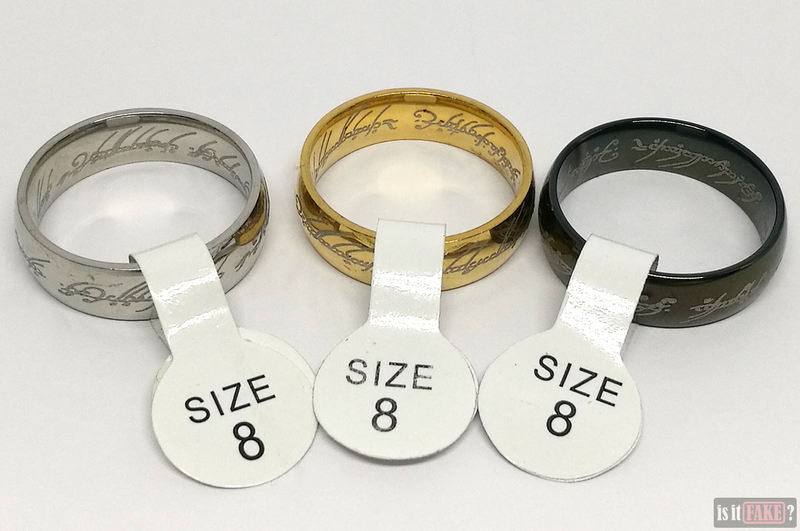 With that said, these official rings are gorgeous premium items made of materials of the highest quality. As such, you can confidently show them off anywhere, at any time. They come in equally beautiful packaging, as well, so they’ll look great as display pieces. 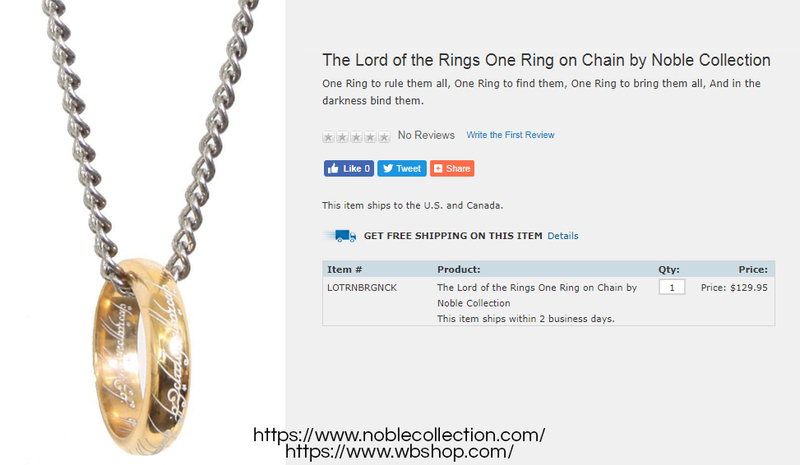 The Lord of the Rings is such a lucrative brand that several legit jewelry makers jumped at the opportunity to produce replicas of the One Ring and other items seen in the Peter Jackson movies. As usual, the best place to go when looking for official products related to a franchise is its source. In this case, it’s Weta Workshop, the New Zealand company that famously provided the movies’ astounding props and special effects. 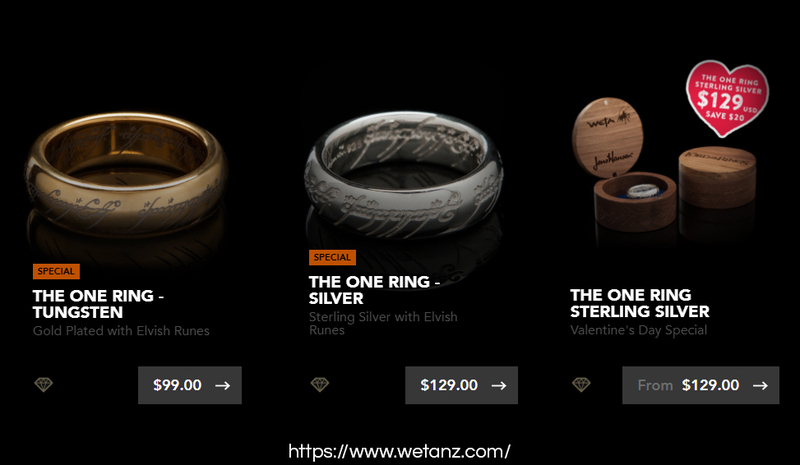 Weta Workshop has an online store where you can buy all sorts of official replicas, from weapons to jewelry. 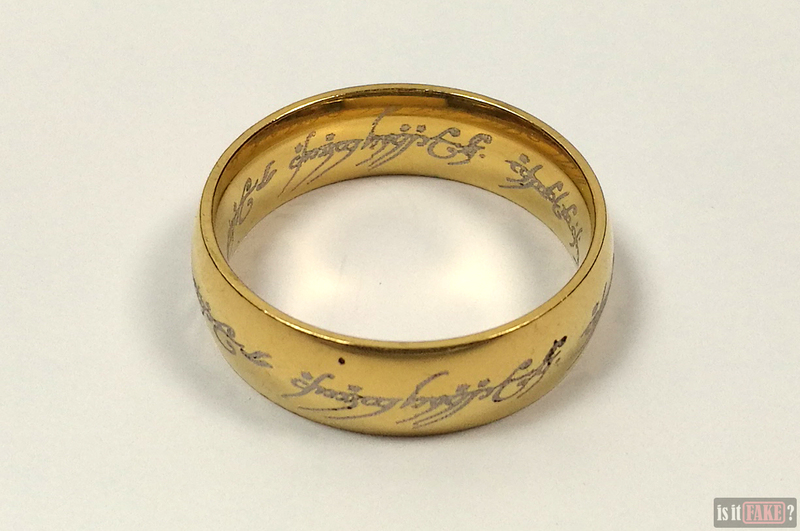 Typing “the One Ring” in the search bar will reveal numerous rings of varying color, material composition, and price. Some may not be currently available, but make sure to visit the site every now and then for reissues of older items. 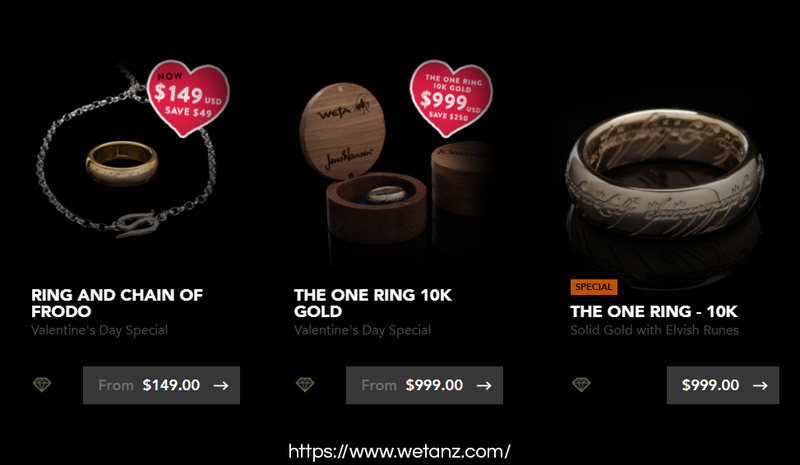 The cheapest is a gorgeous $99 gold-plated tungsten ring created by Jens Hansen. 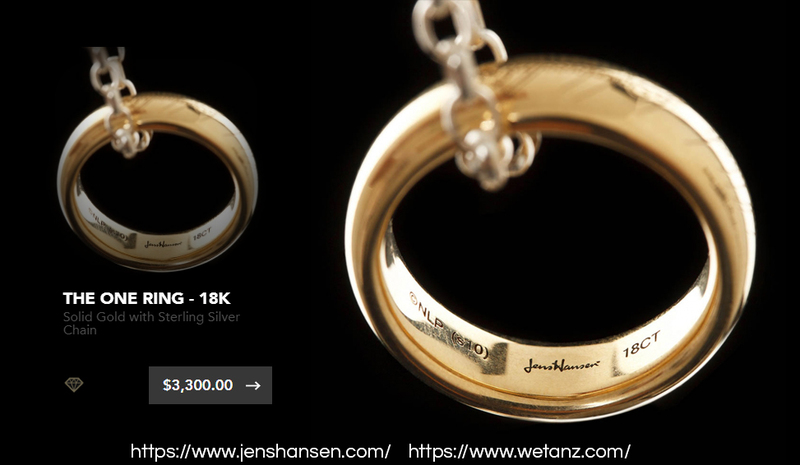 The most expensive is an 18k solid gold ring, also from Jens Hansen, that costs a whopping $3,300. 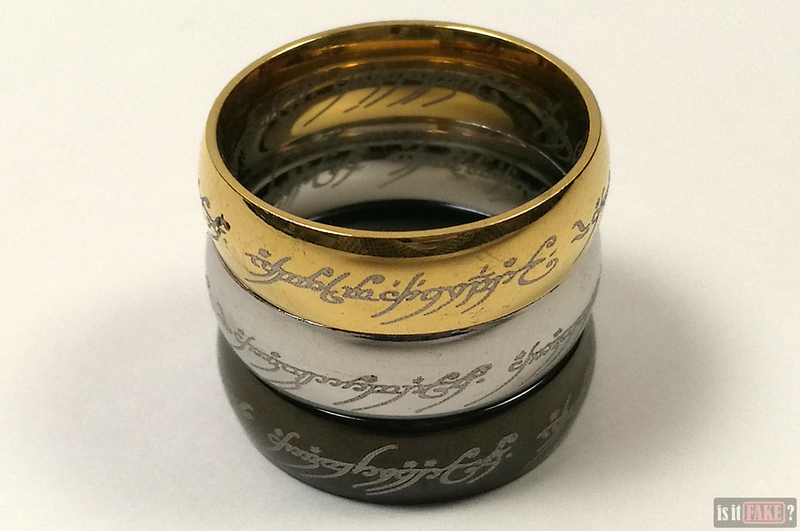 The latter is obviously not for everybody, but if you’re the type who can afford such things, the One Ring replicas don’t get any better than this. 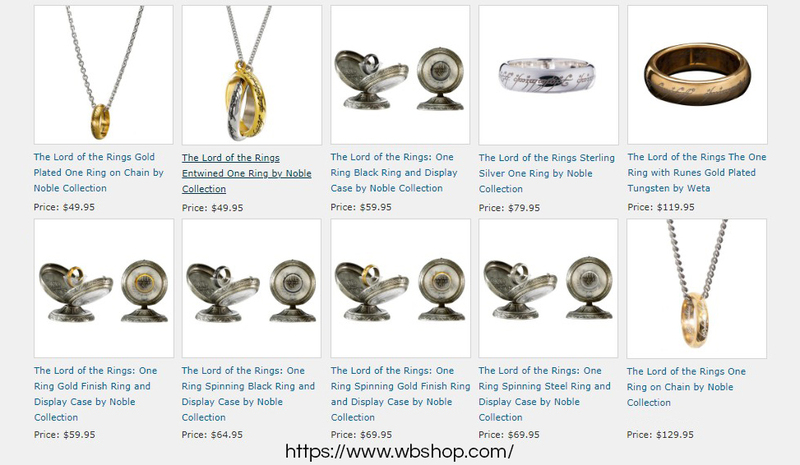 You can also visit the Warner Bros. online store, which sells The Lord of the Rings and The Hobbit jewelry manufactured by various companies. 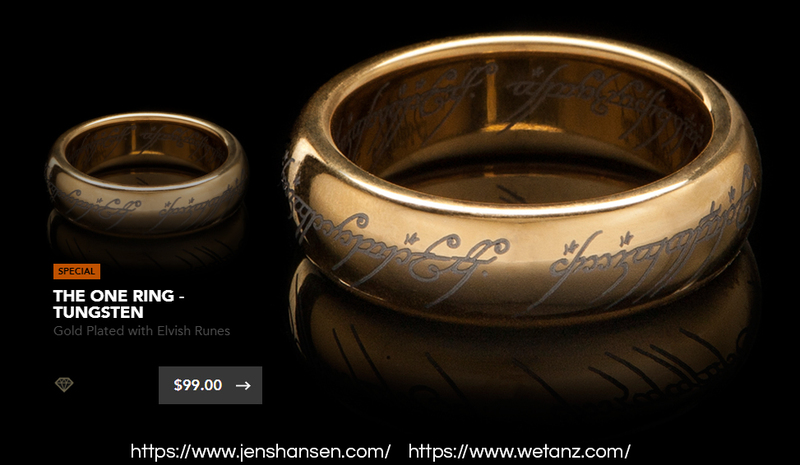 Some of the Weta Workshop/Jens Hansen replica rings can be found here, but so can those created by esteemed jewelry maker Noble Collection. 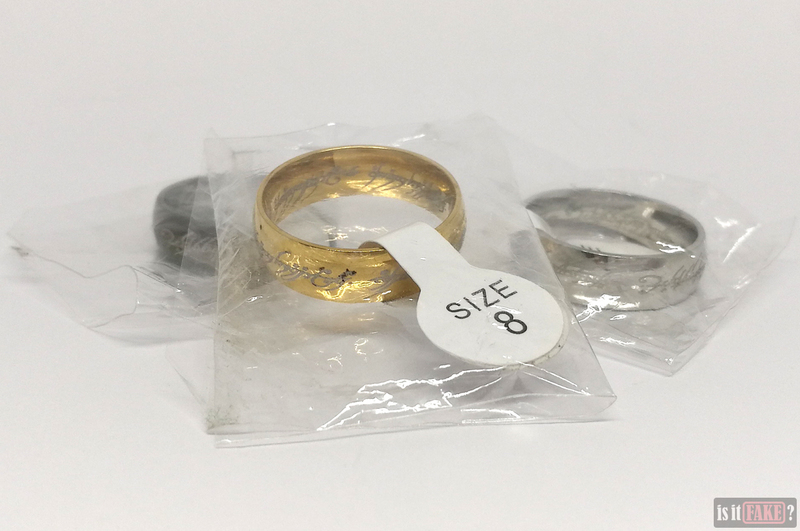 For example, you can purchase Noble Collection’s gold-plated stainless steel ring here; a ring with a gold finish that also comes with a special clamshell display case here; or a unique ring composed of the gold and silver rings entwined, here. 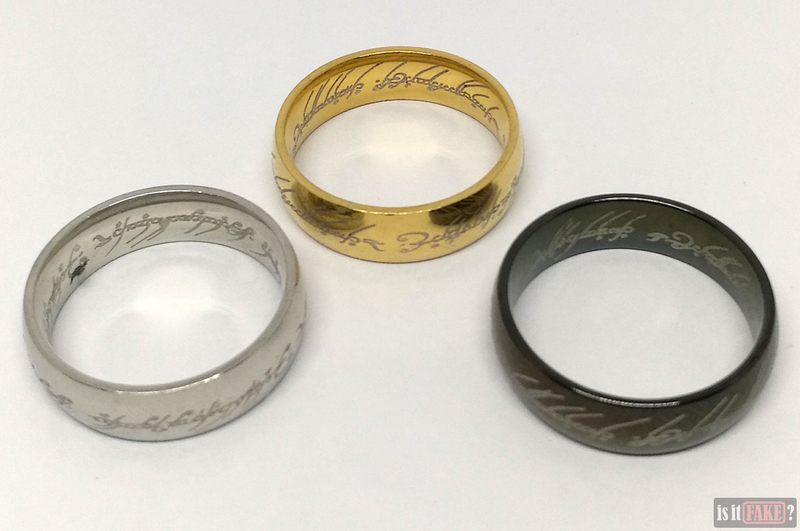 Costing between $50 and $55, these three are some of the cheapest replicas of the the One Ring, but as you can see for yourselves, the drop in price doesn’t mean a drop in beauty. Then there’s this $129 ring, which is made of sterling silver and plated in pure gold. 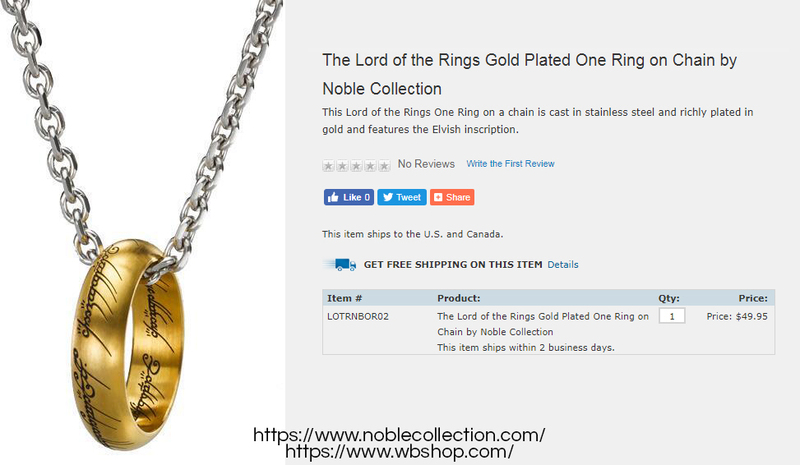 Use the store’s search function to look for more luxury items based on The Lord of the Rings, The Hobbit, and other franchises such as Fantastic Beasts and Wonder Woman. 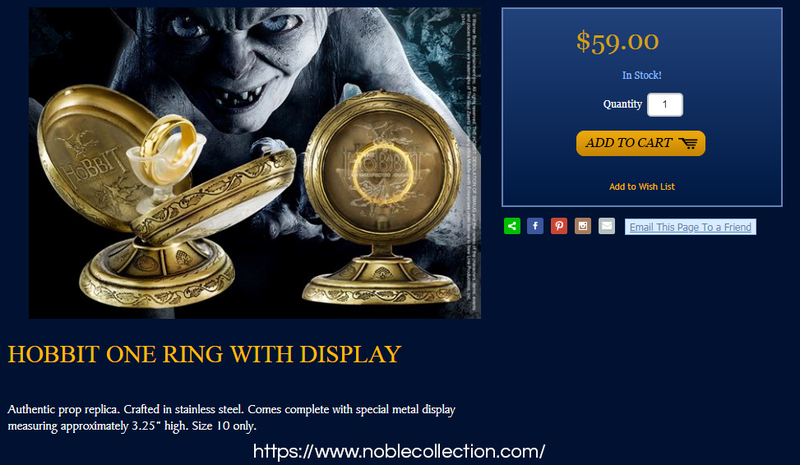 Noble Collection has its own website and online shop. Here you can find jewelry as well as replica weapons, sculptures, and other awesome gift/display items inspired not only by The Lord of the Rings and The Hobbit, but brands such as Game of Thrones and Harry Potter. The $49 gold-plated stainless steel ring is available here. Some of the other versions come with fantastic display stands, such as this $59 variant. This version comes in a range of colors, including black and blue. 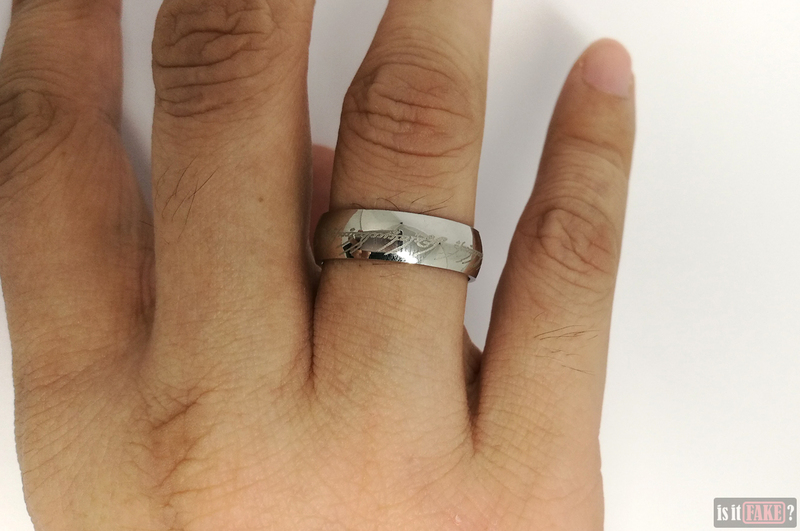 Among numerous others, there’s also this lovely $79 sterling silver ring, which is plated in pure gold, and this 10k solid gold ring, which costs $595. 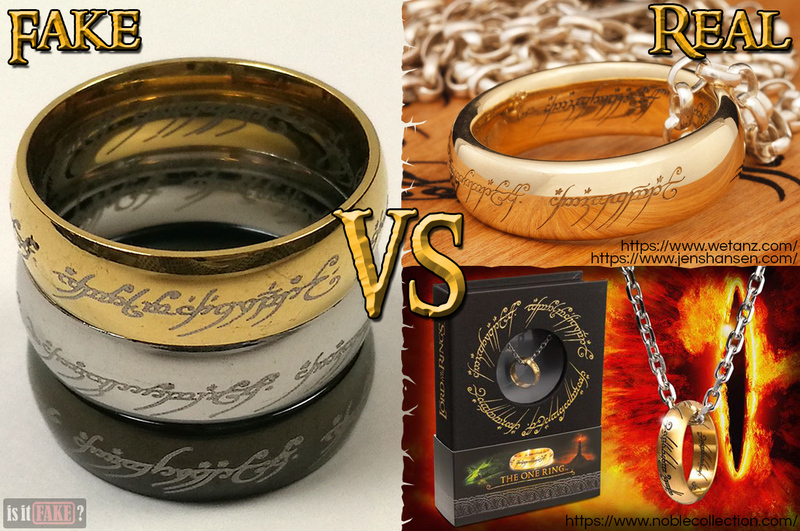 Your options don’t end there, as there are other online stores where you can buy legit One Ring replicas. 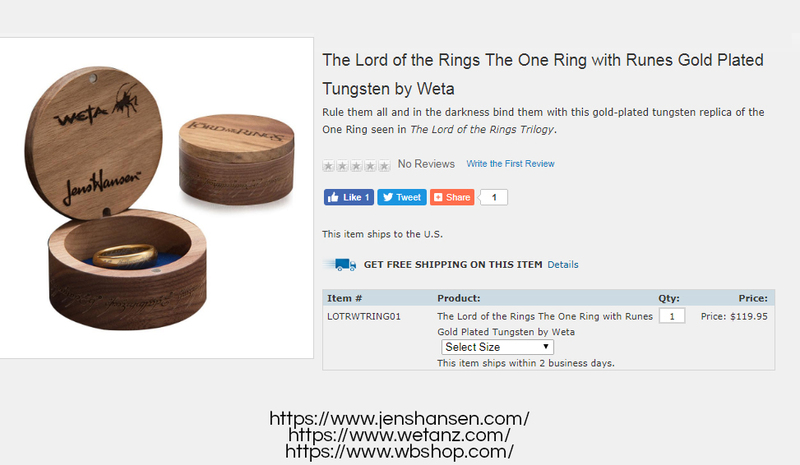 For instance, renowned jewelry maker Jens Hansen, whose works you’ve already seen on the Weta Workshop store, also has its own online shop. 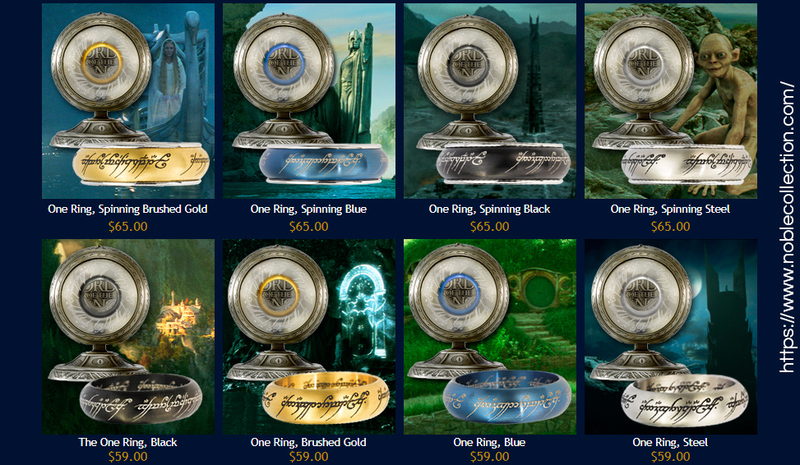 You can also visit the official The Hobbit online store for more goods. 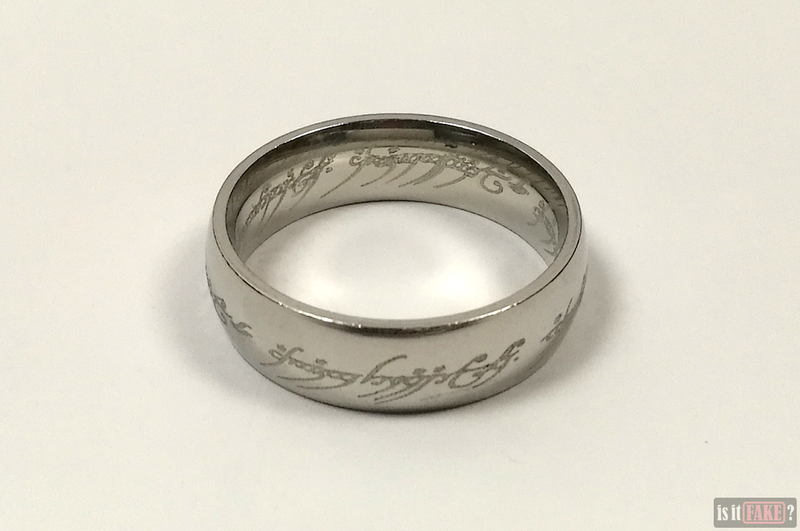 As the most recognizable ring in the world, the One Ring is the kind of jewelry that should elicit everything from admiration to envy in those looking upon it. Sadly, the only emotions these fake rings will evoke are disappointment and disgust. The Elvish lettering is chunky instead of graceful. The plating is chipped in a number of places to reveal the dull, dark metal beneath. In addition to that, there are the potential health risks often associated with cheap jewelry made in China to worry about. 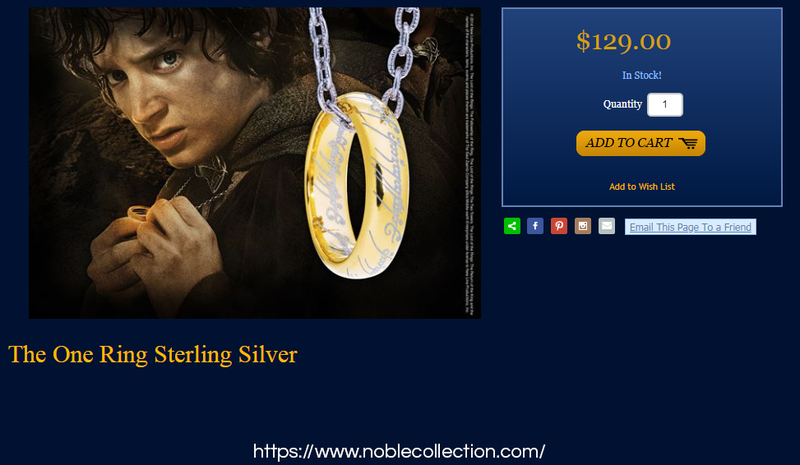 That the bootleggers even lied about one of the rings being composed of 18k gold makes things that much more aggravating. These fakes have earned their 75% terrible rating.